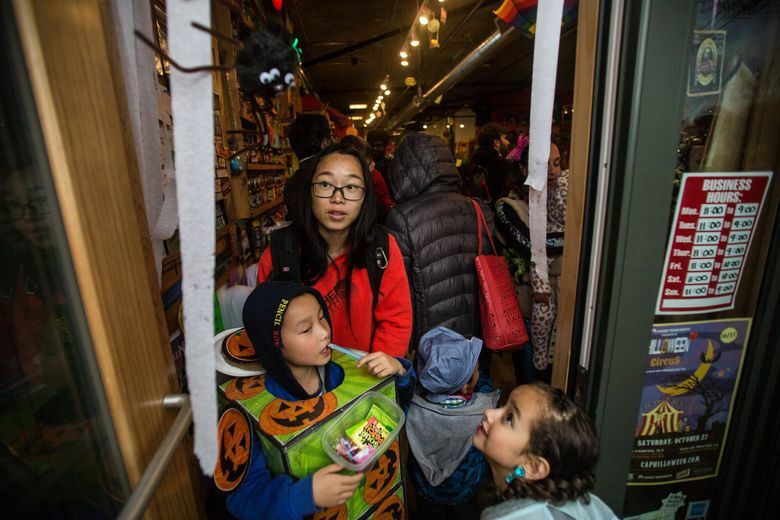 Halloween 2018 starts early in business districts and malls all over King County. Here's a handy list of places to take your little ones. Trick-or-treating starts early this Wednesday, in business districts from Sammamish to West Seattle, Northgate to Kent. Dress up the kiddies and let the fun begin. You’ll be home in plenty of time to hit the sidewalks of your own neighborhood, if that’s in your Halloween plans. For ages 5 and younger, toddler gym, snacks, crafts, costumes welcome, 10 a.m.-1 p.m. Wednesday, Garfield Community Center, 2323 E. Cherry St., Seattle; free (206-684-4788 or parkways.seattle.gov/page/2). Trick or treat from participating merchants, 3-6 p.m. Wednesday, California Avenue Southwest and Southwest Admiral Way, Seattle (westsideseattle.com/west-seattle-herald/2018/09/20/admiral-district-halloween-trick-or-treat-back-kids-big-and-little). Trick or treating, music, games, crafts, for all ages, 4-7 p.m. Wednesday, Safeway parking lot, 9262 Rainier Ave. S., Seattle (parkways.seattle.gov/page/2). Trick or treat at participating businesses, 4-6 p.m. Wednesday, Columbia City, Rainier Avenue South from South Edmunds Street to South Hudson Street, Seattle (columbiacityseattle.com/events). Trick or treat at participating businesses for ages 12 and younger in costume, activities, 4-7 p.m. Wednesday, Northgate Mall, 401 N.E. Northgate Way, Seattle (simon.com/mall/northgate-mall/stream/all-treats-no-tricks-6019257). Trick or treat at participating businesses, costume contest for kids, adults and pets, 5-7 p.m. Wednesday, flash mob dance 6-6:30 p.m., downtown Edmonds; food bank donations requested (edmondswa.com/events/halloween-extravaganza.html). Trick or treat at participating businesses, music, games, 4:30-6:30 p.m. Wednesday, Marketplace@Factoria, 4055 Factoria Square Mall S.E., Bellevue (marketplaceatfactoria.com/events_view.asp?eveid=712). Trick or treat for kids in costume while supplies last, 4-6 p.m. Wednesday, concert 6 p.m., Crossroads Bellevue, 15600 N.E. Eighth St., Bellevue (crossroadsbellevue.com). Treat or treat through the downtown area, 3-6 p.m. Wednesday, downtown Kirkland (explorekirkland.com). For all ages, in costume, trick-or-treating at merchants, 4-7 p.m. while supplies last Wednesday, Redmond Town Center, 16495 N.E. 74th St., Redmond (425-869-2640 or redmondtowncenter.com/event/halloween-tricks-treats). Trick or treat for all ages, 3-4:30 p.m. Wednesday, City Hall, 801 228th Ave. S.E., Sammamish (sammamish.us). Trick or treat at local merchants along Marine View Drive and Seventh Avenue South, 3-6 p.m.; Halloween carnival for ages 12 and younger, 5-8 p.m. Wednesday, Des Moines Field House, 1000 S. 220th St., Des Moines (destinationdesmoines.org). Trick or treat at local merchants while supplies last, 4:30-7:30 p.m. Wednesday, costume contest 4:30 p.m., Kent Station, 417 Ramsay Way, Kent (kentstation.com).